Keeley Loomer Fuzz/Reverb Review - Best Shoegaze Pedal? Keeley Loomer Fuzz/Reverb Review – Best Shoegaze Pedal? I was 3 months old when My Bloody Valentine exposed the unprepared world to their textural shoegaze masterpiece, Loveless. I didn’t grow up bathed in the wash of interlaced fuzzy drones, nor did I spend the springtime of my youth entering a trance state behind Kevin Shields’ wall-of-sound, but I promise you that when I did first did hear it, I was somehow overcome with waves of nostalgic bliss. It’s very important to me to know that in the age of Nirvana and the Red Hot Chili Peppers, a record like Loveless was made and inspired an entire generation of musicians to experiment with sonic textures, becaming a source inspiration for nearly every band I look up to regardless of genre. If you haven’t heard that record, go forth and listen to Loveless at your earliest convenience. Everything in this review will make just as much sense if you don’t, but you owe it to yourself to experience the oppressively atmospheric wash that My Bloody Valentine invented. It is arguably the entrance of shoegaze into the world of accessible music, and you too will find yourself hearing the precursor to countless undisputed champions of modern music. Many of us to this day still struggle to suss out that distinct wall-of-sound tone borne of Kevin Shields’ exhaustive studio work and bolstered throughout by the now-mythical Alesis MidiVerb and the Yamaha SPX90. Few companies have even tried to pull it all off in one package, leaving a hole in the market that is anything but shallow. Keeley’s Loomer, named for the second track on Loveless, aims to fill the void here, featuring both a thick Big Muff Pi inspired fuzz circuit with tone-sculpting response options and three different and unique reverb modes that are not quite what they seem on the surface. Keeley’s been getting zealous with their artist-based/ “neo-vintage” workstations lately, their latest releases including the Jimi Hendrix-inspired Monterey and the Dark Side, a foray into the realm of Pink Floyd. The Loomer is one step further into this grand, tone-copping experiment, and I think we’re all happy that Keeley stepped away from the more traditional guitar pedal vibe to attempt a riskier direction. Decay – In Focus mode, this is both the Reverb decay time and the feedback for the dual delays. Reverse repurposes it as an 8-way switch for decay times ranging from 150-500ms, and in Hall mode it serves as the Decay time. So basically it’s a Decay knob. Check out Keeley Electronics for more info about the Loomer. Okay, for housing two foot-witches and seven knobs, this thing is TINY. With elbowed 1/4” cables in the top mounted inputs, the effective area taken up by the Loomer is about 4.5”x4.5”, making for a ton of tone in a tiny package. The Loomer’s dense metal enclosure features a saturated pink homage to Loveless’ album art, and the blue LEDs next to the foot-switches detract nothing from the haunting decor. I thought it was extra clever on Keeley’s part to reverse the filter of the Warmth knob, making the dark (low-range) tones the furthest point clockwise and the brighter (high-range) tones counterclockwise, as if to insist we push the Loomer to its darkest capabilities. You may be wondering where in the loop you can put the Loomer, considering conventional wisdom tells us Overdrive and Fuzz should be near the start of the chain, while Reverb should be dead last, leaving room for modulations, pitch-shifters, etc., throughout the space in between. Originally, Keeley included a TRS input to allow for signal-chain experimentation, but due to popular demand, they opted to replace this option with a button that swaps the fuzz and ‘verb on the fly. I am actually writing this review with the TRS version in hand, so I can’t write about how well the swap button works, but I can tell you that through use of the TRS input, I can do fundamentally the same thing. More on swapping the reverb and fuzz later. This may be an unpopular opinion, but if I have to have one of the two, I think I’d actually prefer the TRS input over the order button to add my own flavor to the signal chain or to re-order the reverb and fuzz with an effects loop switcher. That said, for most regular guitarists, the convenience of a button to swap the order of the fuzz and reverb on the fly can’t be understated. As Gabriel mused in his initial write-up of the Loomer, “Perhaps we can have them both?” Both are pretty neat options, so I’d like to see it if popular demand insisted upon it. 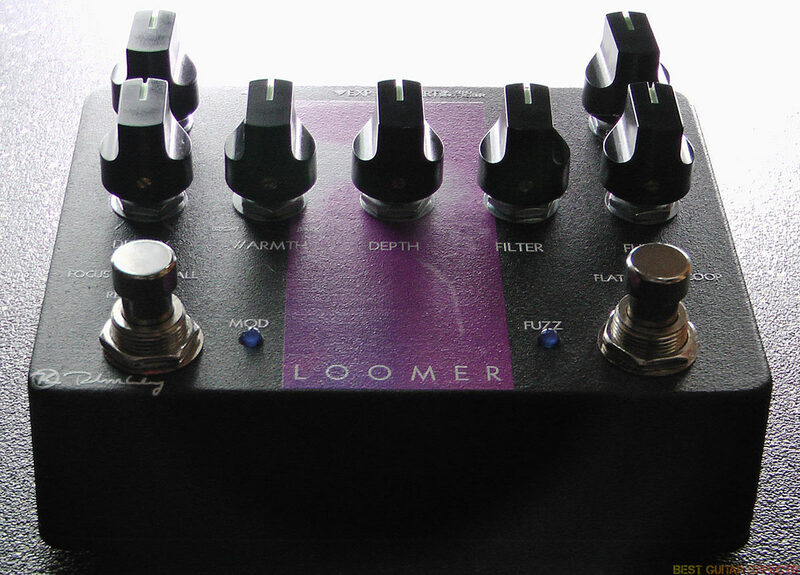 On the right half of the Loomer is a 3-knob Big Muff-based circuit, the same circuit featured in Keeley’s Dark side workstation. You get a Level and Fuzz (gain) knob to control your input level, and a Filter knob to control your tone. The Filter knob is really intuitive, sweeping through a wide range of effective frequencies. Beneath the knobs there is also a neat little response switch that toggles between flat, full, and scooped responses, taking the fuzz circuit from a “nice-to-have” to a full-fledged contender ready to go toe-to-toe with any fuzz pedal on your board. This is a very versatile Muff inspired circuit. The Scoop voicing refers, of course to a mid-scoop, leaving us with just the highs and lows of the frequency spectrum, making for a super aggressive, metal-worthy tone. Of all the voices, I found that this one was the least liable to turn to muddy mush when I cranked the fuzz knob. The Flat voicing offers a much more, well, flat EQ curve, giving you a relatively less responsive range of harmonic content. Meanwhile, Full responds openly to your playing, yielding warmer tones than the other two voices. All of them are high-gain, compressed, hairy options and which one you use primarily will largely be a matter of personal taste. On the other half of the Loomer we have the meat of the whole enchilada: the reverb section. Now, the reverb consists of Decay, Warmth, Blend, and Depth parameters; all save the Blend knob have different functions depending on which of the Loomer’s three signature reverb voices you’re using. The Depth knob, which controls the more musical aspects of each voicing, is also controllable via expression pedal. This gives you reverb into a dual delay into a quad-chorus. Now we’re getting exponential! The Focus is the ethereal reincarnation of the “Soft Focus” patch on the Yamaha FX500 multi effects processor, more affectionately known as “The Sound of the 80’s.” Seriously, playing with this voice clean felt like playing in a Genesis cover band. I promise that’s a good thing. Studio engineers and atmospheric musicians alike have known since time immemorial that running a reverb through a delay garners long wispy tails of air. The dual delay aspect of this voicing is set to 250ms on one side, and 380ms on the other. This creates a thick blend of indiscernible wet signal. The quad chorus of the Focus adds even more body to the already luscious wash of reverb/delay, turning longer trails into impenetrable thickets of warble. The depth knob controls the depth of the chorus, meaning you can amplify the intensity of the effect when an expression pedal is plugged in. I’d love to be hearing this in Stereo right about now, but it’s a blast to play in mono, typical of how most guitarists play anyway. This voicing got the most airtime in Keeley’s advertisements and tech demos leading up to the Loomer’s release and for good reason: the Reverse patch is badass. Based on the reverse effects of both the Alesis MidiVerb and the Yamaha SPX90, the Reverse is technically not a reverse reverb. Where traditional reverse reverbs applied in a studio environment are reversed wet reverb trails, the reverse voicing on the Loomer is technically a delay whose repeats play back affected by a volume swell. That swelling effect is made even crazier by the envelope-controlled vibrato, which will bend the note of your repeats upon responding to the attack of your playing. Keeley boasts that this is designed to simulate the pitch-bending of a trem-bar on a Jazzmaster or Jaguar. In that vein, the Warmth knob is meant to affect the tone the way a rhythm pickup tone pot on a Jazzmaster would. Coupled with the Filter control on the Fuzz half of the Loomer, the options for tone-sculpting are open and plenty. I found the envelope-controlled vibrato to be a little oppressive without the use of the expression input. The rationale behind the use of the trem-bar on the strum is a matter of feel, not bending every note indiscriminately. Thankfully, we can control the intensity of each pitch-bend with an expression pedal, but that adds a layer of mastery we must surmount before truly unlocking the potential of this patch. What’s really beautiful about this setting is the way the repeats push the harmonic distortion of your signal when the Loomer is placed in front of a just-barely-overdriven amp. You know the sound of two notes a semitone away from one another behind an overdrive? Yeah? The Reverse voicing is like a constant wave of that. With the Warmth dialed toward dark and the fuzz filter just a hair past noon you get a really thick ambient rhythm tone. The Hall voicing of the reverb half of the Loomer is a long Hall reverb with an octave-up shimmer that can be blended into the tone at will with the Depth knob (and the expression pedal as I’ve been harping on about.) There’s an undeniable musicality to slowly bringing in that choir of angels that I love to utilize as often as possible, sometimes to inappropriate effect. But getting carried away is arguably a worthwhile endeavor considering how much sheer fun results from the excess. The brighter the warmth, the colder the shimmer will be, so I like to dial back that sharpness with the knob set toward the dark end. This keeps the shimmer from getting in the way of your playing no matter how much wet signal is blended into the chain. 2: Swap the fuzz and reverb halves of the Loomer (and also add effects between the two if you like). The former is fine. It makes perfect sense to the sane mind; use the well-balanced and fully featured fuzz at the beginning of your chain, add your own tremolo, phaser, what-have-you in the middle, and end the chain with the beautifully rendered reverb. Boom, pedalboard complete. To the more adventurous (read: less sane,) the latter is too tempting to ignore in favor of what makes sense. I am one of these people. I love just a teensy bit of fuzz after any reverb. It helps to pop you out of the mix if you’re getting washed out. If you want to get really crazy, the Hall sounds downright terrifying if you crank the fuzz, and what was once a chamber of cherubs singing praises to the universe has been distorted into banshees emerging from a disturbed burial site when you bring the shimmer into the mix. 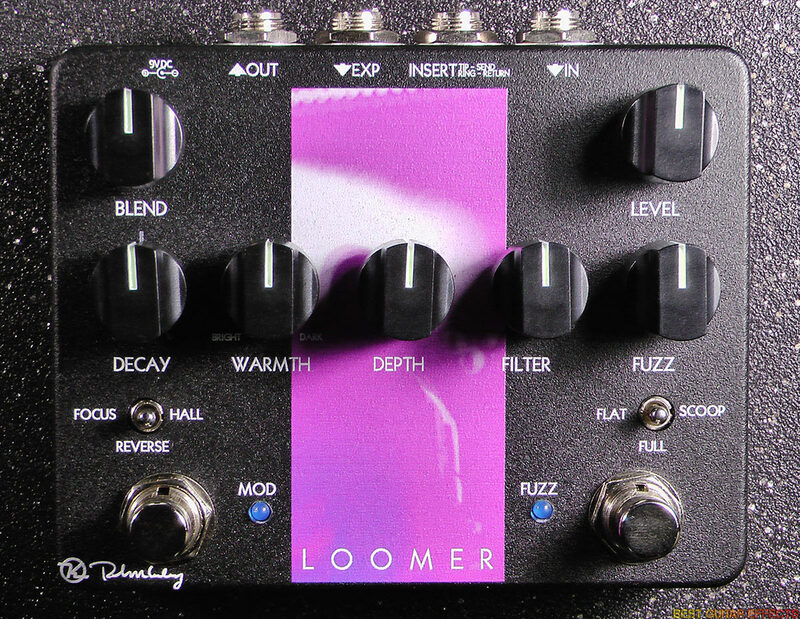 The Reverse can be made to sound identical to the rhythm tone in Loveless’ “I Only Said,” confirming the Loomer as the fastest route to a shoegaze baseline. The Focus’ nuances actually flattened out a little bit when fuzzed out, which I expected, but the way the quad chorus pushed the fuzz made for a brilliant and spooky lead tone replete with clippy, oversaturated modulations pulsing underneath. Wielding a fuzz that sounds massive no matter where you point the knobs and reverbs that are simple enough to be used by any genre but packed with experiment-worthy twists, The Keeley Loomer is bursting at the seams (screws?) with dark mysterious energy. The Loomer is the bread and butter to any shoegaze or post-rock project; it sounds like a black hole in a cathedral at its most extreme. I mentioned before that I think I’d have preferred Keeley stick with the TRS input as opposed to the order swap button, and I stand by that, but each guitarist has their own needs and reversing the order on the fly is arguably more convenient than running a cable from the output to the input and plugging your guitar and amp into the split TRS cable. Maybe Keeley could have gone stereo with the Loomer to get the full range of syncopation with the Focus and Reverse voices, but My Bloody Valentine recorded most of their heavy guitar tracks in mono, so that particular gripe is moot. The inclusion of an expression pedal input allows the guitarist a true musical flexibility that many other reverbs with similar sound quality at similar price points just don’t offer, and with a full-fledged fuzz attached, you can’t ignore it. That concludes our review of the Keeley Loomer. Thanks for reading! They say the fuzz is the same as a big muff. I’ve got a big muff and find them to have way more high end on them. The fuzz in the Loomer is awesome. The other controls allow you to really get tons of different tone from it. The 3?way toggle switch is great and effects it massively. Iv got a jag but it live that when I play my Paul or tele I get that dip in tuning. I’d by it just for the fuzz but the verb, well you could lost for days dialling in tones. Just a quick correction: it is true that MBV records “all” of their guitar lines in mono, not just “most.” In fact, according to Kevin Shields himself, Loveless was entirely mono, and I can’t think of anything that they ever did in stereo, off the top of my head. That said, stereo remixes and widenings do exist on YouTube and such; an example is the excellent “2,” which I wish had been included with this decade’s reissues. i gotta have this pedal!!!!!! I’m personally not keen on the fuzz side tho, doesnt seem that cool & not all shoegaze bands used Fuzz. i own a original Yamaha FX500 & I wish Keeley would just release this side of the pedal & concentrate on the Focus/Hall/reverse as a single/multi pedal, then the choice of dirt is yours. Having said all this, it is supposed to be the ‘Kevin Shields/Loveless’ Sound so…. Still gotta save up and get one.